Pedestrian Streets in the U.S.
San Francisco – 17th Street Plaza, one block (new). 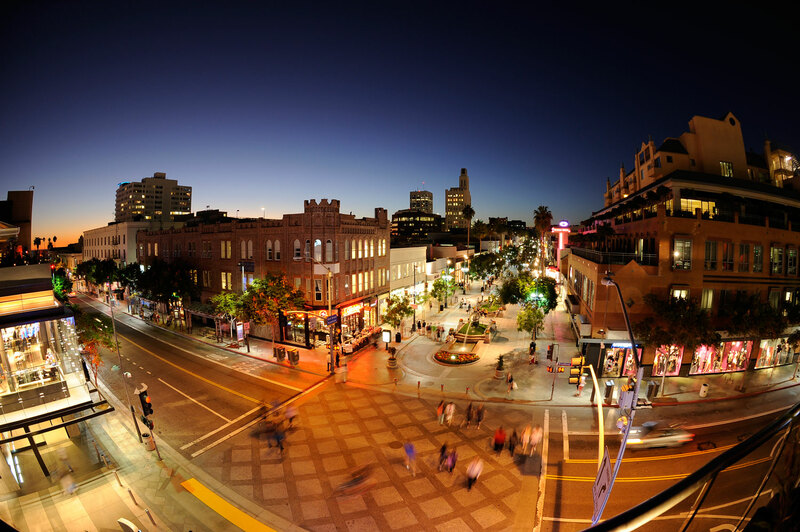 Santa Monica – Third Street Promenade, an award-winning 1/2 mile long street block of shops and restaurants that makes up the heart of downtown Santa Monica. Riverside – Several blocks of pedestrian mall. Boulder – Pearl Street Mall – Several blocks at the city center. Fort Collins – Four streets in downtown. Miami – Lincoln Road Mall, 7 blocks in South Beach. Iowa City – Pedestrian mall, several blocks downtown near the University of Iowa. New Orleans – Several blocks between the French Quarter and the river. Bethesda – Bethesda Lane (part of Bethesda Row), a recently developed vibrant, active lane inspired by European arcades. Silver Spring – Ellsworth Drive – The heart of downtown Silver Spring, a weekend pedestrian zone anchored by theaters and a mini plaza. Ithaca – Ithaca Commons pedestrian mall, two blocks. Cleveland – East 4th Street in the Cleveland Warehouse District, highly popular restaurant/entertainment destination. Knoxville – Market Square, one-block downtown pedestrian mall. Newport – Bannister’s Wharf, a waterfront pedestrian zone that buzzes into the night. San Antonio – Riverwalk, famous restaurant/shop-lined on flood-controlled San Antonio River waterway. Burlington – Church Street Marketplace, four blocks. Charlottesville – Main Street pedestrian mall, several blocks. Madison State Street, six blocks, though buses, police cars and taxis are allowed. 16th Street Mall, Denver; Nicollet Mall, Minneapolis; Downtown Crossing, Boston and Fremont Street, Las Vegas; The Grove in Los Angeles; Fisherman’s Wharf in San Francisco and the myriad Cornish ‘Live!’ entertainment districts are more corporate scale, chain-driven pedestrian districts, but pedestrian only nonetheless.